If the Scream Queens writers are reading this, thank you for listening and I would also like to put in some potential names for the third Green Meanie. But really, who would have guessed that what I wanted to see happen was actually what Scream Queens had planned all along? It looks like Cassidy really is the Green Meanie, something we were teased with in the previous episode but actually got confirmation of this time around. Not only is he one of the killers, he manages to enlist Hoffel to help him out. Neither of them know who the other killer is, and what deaths the third Green Meanie was actually involved in, but that doesn’t stop them from planning more murders down the line. And I would also like to mention how great Hoffel’s backstory actual was. Connecting back to the first season to give Hoffel a motive is actually better because the reminder of the previous events is always great. Scream Queens chose to focus on a completely different location and story, reminding us of what happened before very rarely. In fact, someone could watch this season without seeing the last, so this callback to the original story is entertaining and nostalgic. But Hoffel thinking she could kill Chanel that easily is hilarious, because if the Red Devil and the Green Meanie couldn’t do the job, she isn’t that much better off. The only way she could maybe kill Chanel is by getting help from both Cassidy and the unknown Green Meanie. from the first season put on that green mask and kill the patients off? It’s not like everyone who isn’t around this season just fell off the face of the Earth, I’m sure there’s someone that could have gone a little murderous and vengeful after what happened with the Red Devil. Speaking of the Red Devil, Hester is still someone that hasn’t really grown on me but watching her figure out what’s wrong with the patients was actually entertaining. Maybe her purpose shouldn’t be trying to ”help” figure out who the Green Meanie is, she already knows and isn’t looking to share that information. Instead she could focus on the patients and not interfere with that side of things, especially with the way she managed to help that vampire guy. I’m not crazy about blood but seeing her cook it into a variety of snacks was a little terrifying. Dean Munsch has a lot up her sleeve but giving Chanel all possible STD’s might have been the best part of the episode, besides Chamberlain. She’s one of those characters who you can count on to remind us why Scream Queens is such a ridiculous dark comedy. Dr. Brock and Chanel still makes no sense to me, so Dean Munsch trying to sabotage their weird relationship is like a blessing in disguise. Now Chamberlain isn’t exactly the prime detective on the Green Meanie case but he proved just how much he pays attention. Not only that, he figured out a way to get Cassidy’s mother to give him a salvia sample, something even Zayday had trouble with. If she knows what’s good for this search, Zayday should enlist Chamberlain to help. He’s forgiving and quick on his feet, not to mention how little people pay attention to him if he doesn’t want to be noticed. The third Green Meanie is still a mystery, especially since we have no clue who this person actually killed. Cassidy confirmed that he was the one who ran away from Zayday because he’s scared of her but what about all the other murders? Maybe if we knew who the third Green Meanie tried to kill, we might know their identity. I have my suspicions, and it’s centered around the idea that this unknown is someone from the Chanel’s past. This third killer doesn’t specifically have to be targeting them, they might just be involved because Dean Munsch, Zayday and the Chanel’s are all in that hospital. Chad and Denise were killed by either Cassidy or the third killer and right now my money is on it being the second option. This might even give the Green Meanie a real motive outside of the mystery of the swamp. 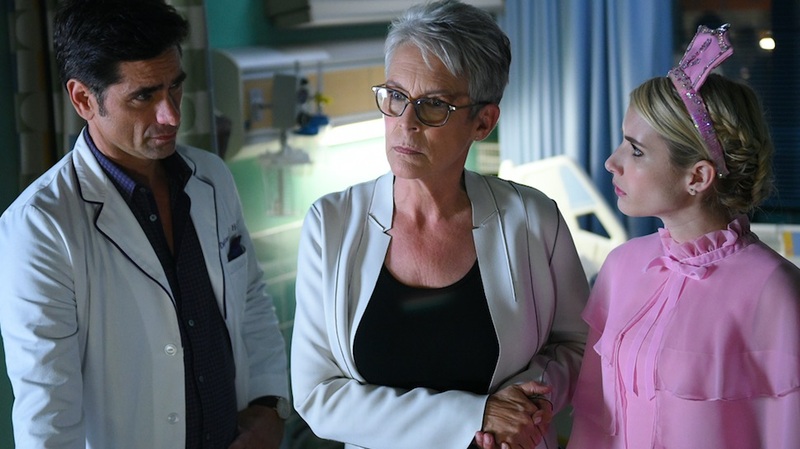 Scream Queens handled the reveal of the Green Meanie in a way that allows the audience to interact a little more with the other side of the story. There’s never enough time to explain the how and the why when the killer is revealed at the last minute, so this should create an interesting twist for the season. Previous ArticleTosche Station Episode 23: The Scenes We're Thankful For in All of "Star Wars"
Next ArticleTV Review: Survivor: Millennials vs. Gen X 33x10 & 11 "Million Dollar Gamble"